Ruxton, Graeme D., T. Sherratt (Thomas N.) and Speed, Michael P.
Go into most backyards and you are likely to see numerous examples o apparently protective color patterns: moths that resemble their backgrounds, camouflaged ladybirds and hoverflies that may gain protection by resembling stinging wasps or bees. These phenomena occur in every ecosystem of the world and in almost every major taxonomic group and have played a unique role in shaping the way both academics and the general public think about evolutionary processes. The very commonness of these adaptations tells us that predation is a phenomenon of immense ecological and evolutionary significance. In the past 20 years our understanding of anti-predator defense has increased enormously. This text draws together exciting new findings of researchers in a well-structured format, highlighting intriquing puzzles that still need to be resolved. See also Tom Sherratt and several former Sherratt Lab members featured in the "Attack and Defend" series (2015) talking about their study species. The series can currently be viewed on Netflix in Canada. Ruxton, Graeme D., Sherratt, T, & Speed, Michael P. (2004). 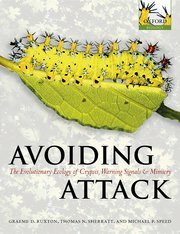 Avoiding Attack : The Evolutionary Ecology of Crypsis, Warning Signals and Mimicry. Oxford University Press.